The first sticky note app with line smoothing! Free and no ads. 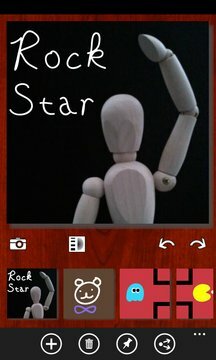 Jot or type a note, draw on photos, and pin them as tiles – all in one app. This is the first app in the marketplace with Bezier line smoothing and option to turn it off. Pictures that you take are automatically rotated and cropped to fit the canvas. Get creative and pin sketches in a mosaic. 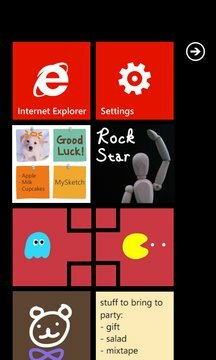 Decorate your start screen. Make a to do list. Stay productive and don’t clutter your permanent notebooks with info that should go on a sticky. 1. Draw on pictures of friends and family. 2. Snap a picture of info you need to take with you. 3. Create multi-part doodles and pin them in a storyboard. 4. Snap a picture of a background to graffiti on. 5. Keep kids entertained and having fun with art. 6. Share doodles through email, Facebook, or Twitter. 7. Choose different color papers, line widths and pen colors. 8. Retain doodles on a scrollable carousel and pick up where you left off. 9. Use copy and paste on text notes. 10. Personalize the app with gorgeous wallpapers.